This section is dedicated to the various books I have recently come to really enjoy reading. Most of them are Star Trek Books, however not all of them are. When I was growing up I hated reading. I mean absolutely HATED reading. It was boring and always put me to sleep. Not only that, I tend to like instant gratification and reading an entire novel took entirely too long. This attitude toward reading continued all the way through college. I hated reading so much that even when I had to read for school (either novels for book reports or even text books) I didn't. I was quite adept at "half-assing" it. I could always come up with the general plot of the story by reading the back cover of the book, the first chapter, the last chapter and some middle chapter. With only this little bit going for me I'd begin writing the book report and then proceed to skim-reference the book for any details I felt was a bit shaky. I was apparently quite good with this method as I never remember receiving less than a B on any book report from middle school to college. I even did this with success on books that the teacher had previously read and knew quite well. So, now you ask, "Well, if you hated reading so much what got you into doing so now?" This is kind of a funny and ironic story actually. After college graduation I got a job doing Software Development for a Government Contracting Company (Northrop Grumman), this position required some travel, primarily to DC. Since at the time I didn't have a laptop I figured I needed something to do on the plane. Now, my first trip was in summer of 2001 and by then I had gotten into Star Trek Voyager on TV. In 2001 Voyager had run its full 7 seasons and was off the air. I really liked Voyager and really wanted more Voyager stories. I really had no idea that Star Trek was even in book form, but seeking something to do on the plane I ran across the Star Trek section in (I believe it was) an airport book store. Being ridiculously early for the plane I stood there and read the back covers of the books that seemed somewhat interesting. 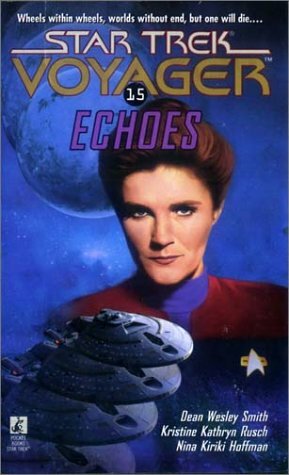 I ended up purchasing Star Trek Voyager: Echoes. This book was SO good that I finished it in two sittings. Neither of which were technically on the plane. I slept on the plane read the first 3/4 of the book in the hotel room and the last 1/4 when I got back home. The book was so good that I HAD to get more Voyager books. Over time I got into the other series' books and over more time I got into Deep Space Nine (on DVD through Netflix) which I had only seen a few episodes before this eventually let me to the DS9 books too. Recently (June 2004) I'd set a goal for myself that I was going to read one book a week. I've done fairly well with that, although I've not made that goal a few times. Things like work, video games, friends, boyfriends, and book quality have all been hindrances in completing books in a timely manner. My new position at Cerner Corporation has VERY greatly hindered my ability to keep up with this schedule. But I do still read the series I like most as often as I can.